This wonderfully whacky book opens with children perhaps pretending to be giraffes who eat raisins. There is a family of minnows like or maybe not like the children who pontificate about the colors in a crayon box. There is a somewhat darker, scarier reality where these very minnows recognize that a tumor is mirroring a pregnancy. But life, rendered here with a tender mix of the curious and the bizarre continues to unfold with all sorts of surprises as the minnows populate in bigger, bolder colors. The children wonder if giraffes have a place to hide. It is a lingering question in this wild savanna that is at once a sea, a jungle, a home for a family and all things in between. In this minnow-esque world it is hard not to keep dipping and swaying like the tide, but not like the tide itself, as the narrator, who is still a minnow falls in love and thinks that she is a bluefish. There is profound subtext about the clashing of religions and of self and identity in a relationship. The realization is so like a jellyfish, beautiful and stinging. Novack says, "He had a way, a way of looking into what I thought I was that made me disappear slowly like a jellyfish, disappeared like a jellyfish under a malignant moon." The disappearance of the jellyfish here is as metaphorical as the movie the couple watches while immersed in the replaying of their own life. We sense a past lust between the couple with the zipping and unzipping of pants and the grabbing of breasts. There is the impression that this couple has shared a life time with the dentures of old age juxtaposed with the narrator's memories of being a child and asking her father what they should do about the minnows. It's an age old or age young question in this book. The father ponders putting them in the wash with moonshine to quiet them or in a burlap bag and drowning them. There is the tableau of the father's tears, the mother's belly protruding from a tumor and the chickens in the barn spitting blood from the disappearing icebergs. The baby minnows themselves are not forgotten. They're witnesses, the sacrifices of childhood lost or maybe not. They are screaming and the narrator like the giraffe earlier needs a safe place to hide. She decides to live in a fallout shelter. In other stories there is a couple defined by the clashing of colors that form a majestic tapestry alternating between red, to mauve to cerulean to black as an identity is found and the hopes of muting it have failed. There is a mother at once dwelling in a coffin of white mums. Her child is described with Miro-like eyes and as one who is greedy for light. It's the life and the love the child seeks from her mother. She doesn't want to be the giraffe in hiding and in the wilds of a savanna. It is what isn't said, that is as beautiful as what is said in Novack's writing. Her stories leave the readers questioning…and…thinking about the wilds of tomorrows for the minnows, the giraffes and anything that just might need fins and gills to swim. Or a long neck to see what's on the horizon just in case they need to hide. If just for a spell, until they understand that which maybe they couldn't understand. 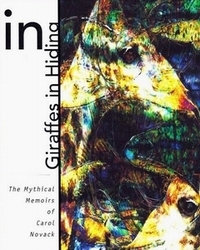 Carol Novack's distinct style of writing is more aptly called, Mad Hatterism and is as startling with its lyrical, playful language as it is bewildering with its subtext and hidden meanings. There is no doubt the Giraffe Is Hiding, but like in that childhood magazine, Highlights, you just have to search through the foliage to see those curious, bewitching ears twitching. Julie Ann Weinstein is the author of the magic realism collection, Flashes from the Other World. She has over ninety pubilshed short stories and is a flash fiction workshop leader. Julie's website is http://www.julieweinstein.com and her blog is http://www.flashesfromtheotherworld.com.